Parker’s Grill, come as you are, welcomes with smiling faces and familiar smiles that sets the mood for a peaceful intimate dinner at reasonable prices. The menu brims with a variety of European dishes, many of which hold a loyal following. From Eisbeins with saukraut, to mixed sausage platters, Kassler Rib and oxtail, Parker’s Grill knows how to satisfy with international flavours. Starters entice with half-dozen snails saturated in cheesy garlic and butter sauce, grilled calamari, springbok Carpaccio and mussels. Or try the thick green pea soup with pork. The giant blackboard proudly displays delicious specials such as grilled Canadian salmon, warthog shank with paprika sauce and red cabbage and osso bucco. 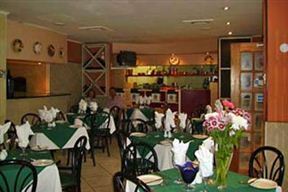 The extensive menu delights with pizza and pasta dishes and surprisingly popular Indian creations such as Chicken Korma, breyani and enticing selections of fish, poultry and meat creations. Dessert tempts with chacha pudding sinfully layered with peppermint crisp biscuit, caramel and whipped cream or a traditional Apfelstrudel decorated with a dollop of cream or ice cream. Enjoy a glass of wine from the extensive wine list alongside a delicious meal and warm hospitality at Parker’s Grill. 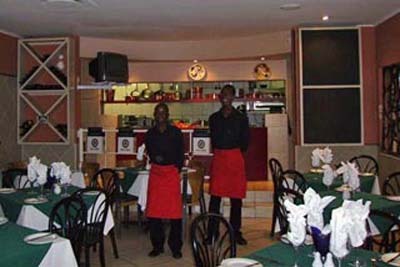 Parker's Grill is 0.6km from the centre of Johannesburg , the nearest airport 21.8km (Johannesburg International Airport).